The NHL trade deadline is looming, which means it’s time to engage in a little rampant speculation. This year, things are looking up for a number of Canadian teams as the playoffs loom, which means that some interesting moves could be on the table come March 1. The Montreal Canadiens are currently first in the Atlantic Division with a 31-17-8 record. They’ve got about $4 million to burn at the deadline, which doesn’t give them a lot of cash to work with. They do seem to be in the market for a second or third line centre, having solidified their defence with the January 26 acquisition of Nikita Nesterov. Right now, the Habs are looking at a group of pending unrestricted free agents that includes Brian Flynn, Alexander Radulov, Andrei Markov, and David Desharnais. Re-upping Radulov is something that Montreal fans are hoping happens sooner rather than later, as his offensive contributions have driven this team to the Promised Land. That has driven up his value, however, and it’s unlikely that the Canadiens will get away with a smaller deal this time around. In his initial signing, there were question marks around Radulov’s attitude. Now, he’s answered his critics and could fetch a pretty penny. The Radulov situation could cast a shadow over Montreal’s movements come trade deadline day, but general manager Marc Bergevin has proven himself capable of shaking things up. He pulled the trigger on the P.K. Subban/Shea Weber deal, after all, so he might be looking to stir the pot once more. On the other hand, he might be willing to stand pat. 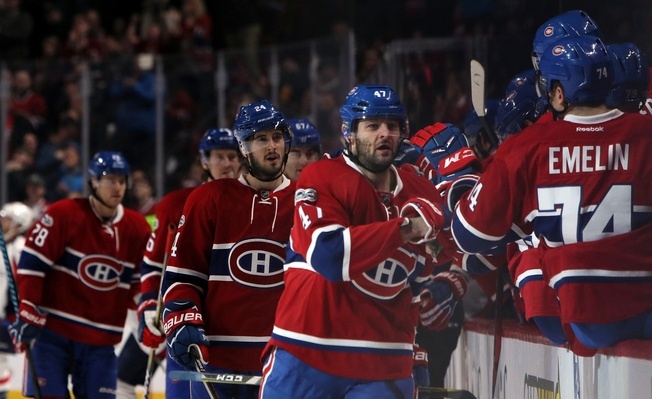 The Canadiens like what they have and they like their chances. There are some bargaining chips in the mix, like winger Michael McCarron and perhaps Tomas Plekanec, but I wouldn’t be all that surprised if the club was quiet on March 1. Last year, Montreal made two deals. The first sent Tomas Fleischmann and Dale Weise to Chicago in exchange for Phillip Danault and a pick, while the second saw Stefan Matteau arrive in exchange for Devante Smith-Pelly. This year, it’s anybody’s guess. But with the UFAs on the docket and some attractive targets on the market, Bergevin might just take a swing at coagulating his forward core in time for a strong post-season run.